Striving to eat clean, wholesome foods, and lead a healthy lifestyle, in the real world. When you think of the holiday season, does it stress you out? Come January do you remember the lethargy, the exhaustion, and the weight-gain? Did you know it doesn’t have to be that way? Christmas dinner, which is normally a calorie, unhealthy fat and sugar bomb, is one of the biggest culprits. Many people assume that it has to be that way, because really, who’s going to sacrifice a traditional Christmas dinner in favour of making it healthier? We can worry about the consequences later, right? But how often do we look back on the jolly-making, and rather than remember the amazing food we enjoyed so much, we regret it because we feel gross and have gained weight? Does it ever seem worth it in the end? Well, I have some GOOD NEWS! DELICIOUS Christmas dinner, and all the trimmings and desserts, can still be enjoyed. Really! The key, is to make everything in a different way, in a way that doesn’t tear down our bodies. The best part of this dinner? I portioned it into three MORE Christmas dinner and froze them, so I can have Christmas dinner a few more times for lunch!!! All the things you see in the above picture are below. For your convenience, everything is to be cooked at the same temp, with the exception of the last few minutes of the vegetables (see the roast veg recipe below). 3. Vegetables to be added 20 minutes after you add the stuffing. To be turned up after the stuffing and chicken have been removed. Keep an eye on them! The veggies will take a few minutes to cook after the chicken and stuffing are done. That's OK--just keep the chicken on the stovetop, covered, and the stuffing on the stovetop covered also, until the veggies are ready. They'll keep warm and be ready when you are. In the meantime, if you need to heat up the gravy and potatoes, you can do it while you're waiting. The easiest way I've found to flavour a roast chicken is with rosemary, lemon, and a bit of sea salt. All you have to do, is spritz olive oil over the chicken, sprinkle a bit of sea salt, and cover the chicken with as much rosemary as you like. Fresh rosemary works best, but dried is fine--just remember to use 1/2 as much if you're using dried, as it's more potent. Then poke a bunch of holes in a lemon or two, and stick it into the chicken's cavity, along with some more rosemary. Roast covered for about an hour on 375F, then uncover and continue roasting for about another hour (the exact time will depend on the size of the chicken--will usually be 90 minutes to around 2 hours). Then just take it out of the oven, plate it and let it rest for a few minutes (so that the juices relax, and don't come pouring out the minute you cut into the chicken--keeps the meat moist), then serve. Easy! * I used more mushrooms, and also added about 6 soaked dried mushrooms to make it mushroomier. * I didn't use vegan margarine, I just spritzed the pan with olive oil. * I used Bragg's liquid amino's (called Bragg's All-Purpose Seasoning in Canada) instead of the soy sauce, just because I like it better with mushrooms. * I used whole wheat pastry flour (sometimes called "soft" whole wheat flour) for the flour it calls for. * I also made sure to cook the mushrooms on a higher heat, and for longer than it calls for, because browning the mushrooms make it mushroomier too. AND I used the dried mushroom soaking liquid in place of about 1/2 cup of the vegetable broth it calls for, because, you guessed it--it makes it mushroomier! The rest of the recipe was the same, including the instructions. SO tasty! I don't know about you, but I LOVE good gravy! Boil a pot of water with some sea salt in it (sea salt makes the flavours of the potatoes come out). Peel and chop potatoes into chunks. Since sweet potatoes cook a little faster than white potatoes do, be sure to make the sweet potato chunks a bit bigger, so they'll be the same time cooking. You can leave the russet potato peels on if you like (there's more nutrients that way), but be sure to peel the sweet potatoes. Cook the potatoes until both kinds are soft. Drain, but don't rinse--you want the starch on the potatoes. Reduce the burner temperature to low, and put the potatoes back into the same pot (why make more dishes?! ), and add butter. With an electric hand mixer, or with a hand-held potato masher if you prefer to go old-school, mash/whip the potatoes enough that the butter is well mixed in. Add the homo milk/half and half, and salt and pepper, and mash/whip until the potatoes are the consistency you like. Set aside until needed. It can be made a few hours, or even a day before they're going to be served--just re-heat on medium-low heat, stirring/whipping until they're fluffy again. Great time-saver! Note: Stuffing should be added to the oven with the chicken when it's about an hour from being finished. Chop roasted garlic up as best you can (it's sticky!) and add to a mixing bowl. Throw in all other ingredients, except the stock. 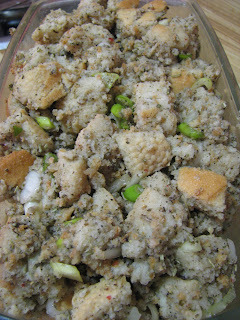 Toss thoroughly, making sure that all the pieces of bread are covered in the seasoning. Add the stock, just enough that the bread soaks it up when it's tossed, and that the bread is evenly moist, but not so much that the bread is saturated. Place loosely in a non-stick or sprayed pan, cover with tin foil, and cook for 40 minutes. Uncover and cook for about an additional 20 minutes. Do not allow top to burn--it should just be crunchy, but not dry. If you're afraid it's geting dry, check it by sticking a knife in the middle and peeking. 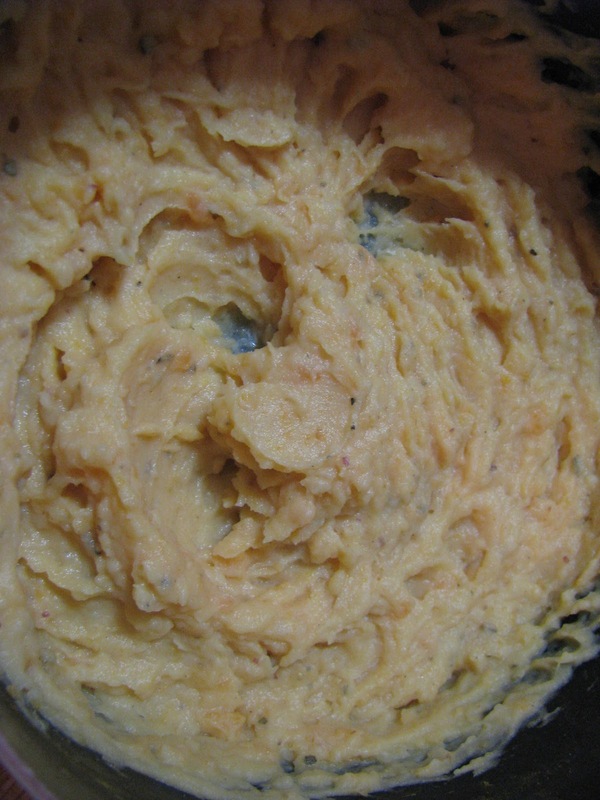 If the middle is moist but not overly so (like finished dressing would be), it's done. It's OK to take it out of the oven even if the chicken isn't done yet--just re-cover it, and set it on the top of the oven. That should keep it warm until you need it. * To make roast garlic, chop off the top bit of a head of garlic, wrap the whole thing in tin foil, and pop into the oven at 375F. Roast until the cloves are soft. Allow to cool, and just squish the soft clove centers out of the skins! They're quite sticky, so be sure to remove the white papery outer skin first, otherwise you'll have all the paper stuck to your fingers! 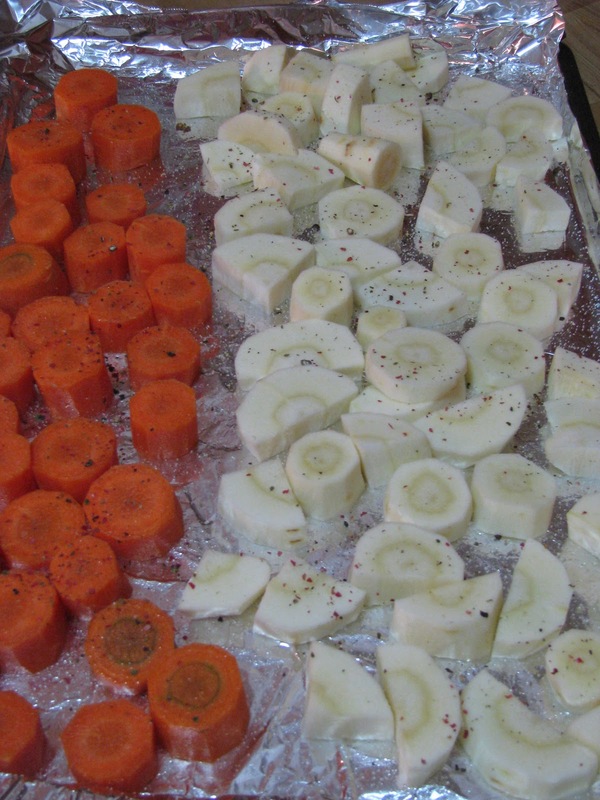 Any root vegetable is delicious roasted, and it's the simplist and yet most nutritious way to cook vegetables! 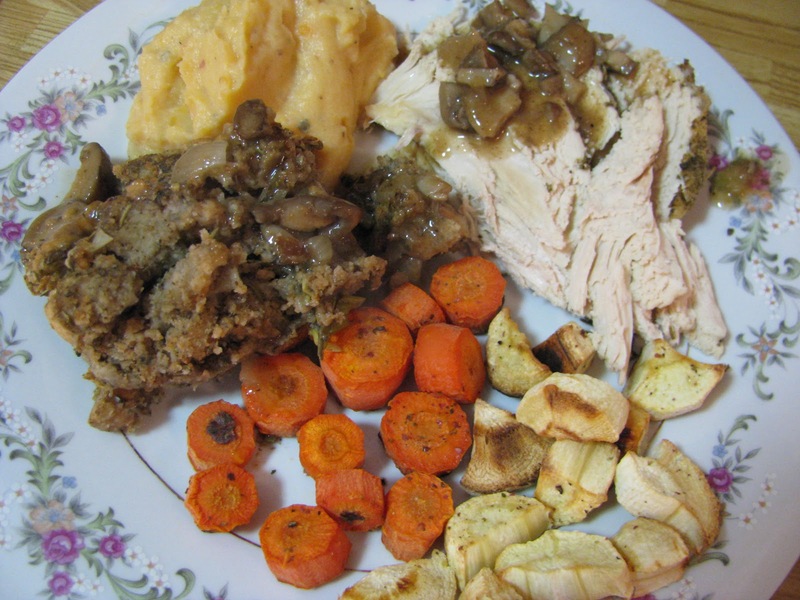 Carrots, parsnips (in the pic), turnips, Brussels sprouts, beets etc are all delicious roasted. Just peel if they need to be peeled (baby beets just need to be trimmed, since the skins are edible). Brussels sprouts should have the outer leaves removed (because of pesticides), and be halved. Chop everything else into equal bite-sized pieces. On a baking sheet, sprayed with olive oil, arrange vegetables cut-side down. Spritz tops with some more olive oil (don't worry--with a spritzer you're using very little) and sprinkle with sea salt and fresh-ground pepper. Cook at 375F for about 40 minutes, then when you remove the chicken and stuffing (if it's still in the oven), turn the veggies over, and turn the oven up to 425F. Allow to roast for about 10 minutes, so they start to caramalize a little. Keep an eye on them!